Celebrated every January, National School Choice Week is the world’s largest annual celebration of opportunity in education. School Choice means providing the best opportunities to help children succeed in school and in life. 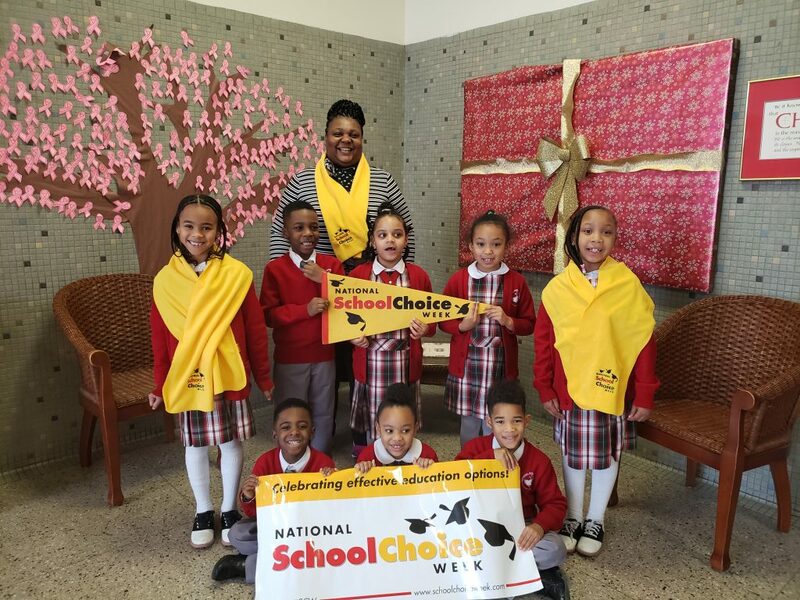 To celebrate National School Choice Week, CSFB Program Administrator Joanne Sanders visited CSFB participating schools to celebrate school choice with the students. We were able to sit down with her to talk about her experience and why this week is important to celebrate. 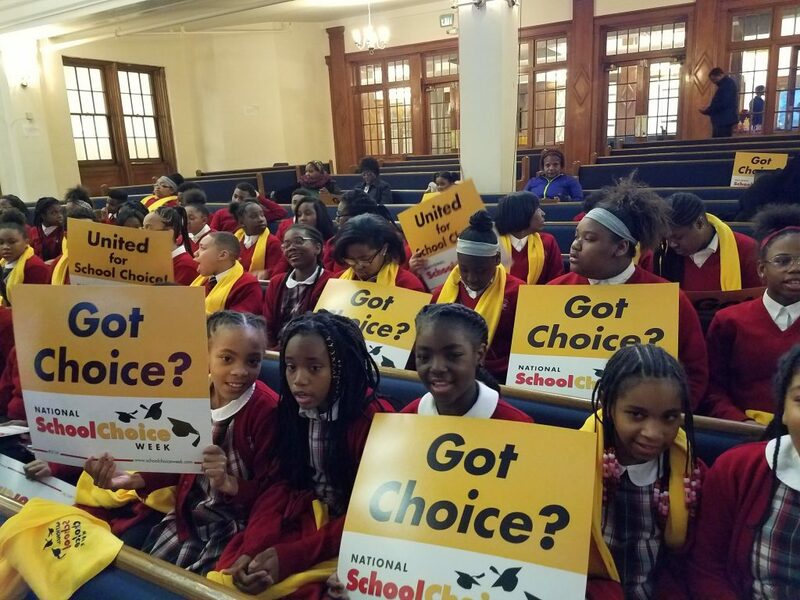 Why is it important to celebrate National School Choice Week and acknowledge school choice? I feel that it’s an opportunity to be a voice for children who may not have voices of their own. It’s a chance for us to fight for children to go to the school of their choice and that the parents feel meet the child’s needs even better than their local school. To tell the world that we need to have school choice and shouldn’t limit it to those who can easily afford it, or live in a neighborhood close to a good school. While you’re visiting the schools, what do you discover about the school/kids? What I discover about the schools are the different ways they engage the students. The teachers have come up with all kinds of creative ways to stimulate the child’s mind to make sure they don’t just know the material, but actually understand it. That’s what I love – how they engage students with the different learning tools they use. This has always been enlightening to me… I can visit a school many times and it’s so exciting to see the new ideas teachers come up with to captivate some of the same students from previous years. What’s your favorite part about visiting the schools? My favorite part about visiting schools is getting to know the staff and listening to their enjoyment of teaching and working with children – many principals stay in their positions for years because education is still exciting to them. I love interacting with them too. I love how the families know the school staff and how the staff know the families. For example, I’ve visited Our Lady of Victory [a CSFB School] and a teacher there had taught some of the athletes that played for the Baltimore Orioles. She’s been with the school so long she even knows their children and grandchildren. I have an awesome job. Do you have a favorite CSFB story to share? Or your favorite part of working with the CSFB students? I have a lot of stories, but one story that stands out to me is about a mom. She had received a scholarship through our Lottery, but she was worried that it may feel like a burden for her to receive it. She thought the scholarship would come with some stipulations, so she passed the opportunity. Well, a couple of years passed and her name was chosen for her other child, and she came to that first intake meeting. I spoke with her and she said what made her come this time is that she talked to other CSFB parents and she found out that we do not make anyone feel like they are receiving a handout. I assured the parent that it is not a burden and that she is doing the best she can for her child. Over the years, we have grown fond of each other. Her children have graduated, but she still calls me once a year just to say hello! Is there anything else you would like to add about National School Choice Week? I’m glad it’s celebrated nationally. It’s not just here in Baltimore … it’s all over the world! The need is there. We really need to be advocates for our children, and not just talk about it, but actually do it. Do what needs to be done for our children. Thanks, Joanne! We learned a lot about why school choice matters and why we celebrate it on a national level. If you have any questions about how school choice can benefit your child, contact us!